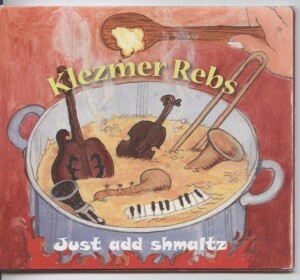 Listen to The Klezmer Rebs playing and being interviewed by Jim Mora on Radio New Zealand National’s Afternoons programme on 7 August 2009. We’ve just added videos of Leibidek un freilech, Sympathique (from our new CD Just add shmaltz) and the unrecorded new song by Reb Urs, Anarchia Total! It was a triumph for the Rebs last night at the Soundshell in Wellington’s Botanic Gardens on a perfect, warm and still night. A packed crowd (1500 according to the Festival organiser!) saw the Rebs (with help from Blue Highways bassist Jim Nicolson) play perhaps our best show ever! The audience seemed to love it and the mosh pit dancers jumped with wild abandon. Photographer David St George took some nice arty black and white shots of the gig that you can see here. And here is a shot, complete with dancing girls, taken by Heather’s beau. Reb Jonathan ‘launched’ copies of our new CD into the crowd and the Rebs sang and played our hearts out. We made a few mistakes (although few but the band members noticed) but we wouldn’t be the ‘Rebs’ if we weren’t a bit rough around the edges. We really enjoyed getting the new material out there to good response. In addition to the tunes on our new CD Just add shmaltz (available on this website) we played 4 brand new songs: 1) Zvezda a ‘filthy’ Russian cover of a song by the band Leningrad; 2) Kandilitas, a Ladino song about lighting the candles for Hannukah; 3) Bublichki, sung beautifully by Reb Rose, is an old Barry Sisters song about a seller pleading for customers to buy her bagelach; and 4) Anarchia Total, Reb Urs’s new anarchist anthem. Thanks Wellington for a great night and thanks to Wellington City Council for the opportunity. We next play in Wellington city on Waitangi day at Waitangi park (about 12.30ish), but Klez-groupies can see us this Sunday the 18th at the Otaki Organic River Festival at 2pm and out at the Festival of the Elements in Porirua (again on Waitangi day) at 3.30pm. Kumt kumt kumt hear the klezmorim play! Note: There were some concerns about security before the gig. For more on that, check out this on line article. Our first full length studio CD, Just add shmaltz, has just been released. Just add shmaltz (just for you – such a deal!) the cost is $20 per CD (pickup or drop off in the Wellington CBD available by arrangement), or add $4 (in NZ, or $NZ10 overseas) and a barefoot Rabbi will personally deliver it to your mailbox (we haven’t told the Rabbi yet). Rabbinical advice costs extra. To order, visit our CD order page. Just add shmaltz is over 2 years in the making (such a difficult birth!). 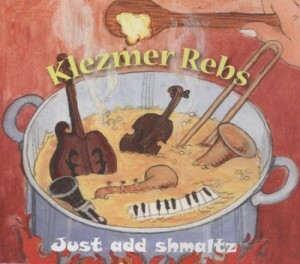 It features nearly 50 minutes of new Klezmer Rebs studio recordings. The 14 songs include several new Rebs originals, something French, something Russian, something Italian, and plenty to scratch the klezmer itch until our next live performance.